New Hampshire and Maine will close out their three-game regular season series this weekend when the Wildcats host the Black Bears for two. - #12 Northeastern looks to move back into the win column this weekend after dropping both games of a home and home series with Providence in their two most recent outings. The Huskies fell, 4-1, on the road Friday, before being shutout, 3-0, on home ice. - UMass Lowell enters this weekend riding a seven-game unbeaten streak after taking three points in Hockey East action from Boston College. The River Hawks beat the Eagles on the road, 3-1, before playing to a 4-4 overtime draw at home. - Ryan Dmowski (East Lyme, Conn.) pushed his point streak to six games after netting three goals and dishing out an assist on the weekend. His goal on Friday night was his fifth game-winning tally of the year and third in a row for the River Hawks. - Providence plays host to Vermont for two games in their first meetings since last February. Those games were played at Gutterson Fieldhouse, with the Catamounts posting a 1-0-1 record to take the series. - The Friars welcome the Catamounts to Providence after winning two in league play from then-#8 Northeastern over the weekend to win back to back games for the first time since Dec. 30 - Jan. 4, going 1-3-1 in the span between. - Hayden Hawkey (Parker, Colo.) earned Hockey East Player of the Week honors after turning away 53 of 54 shots faced on the weekend. The senior recorded 34 of these saves on Saturday en route to earning his fifth shutout of the season. Hawkey earned his 63rd career win and his 13th career shutout in a Friars uniform in the process and is just one shutout and two wins shy of setting new program records for Providence. - Vermont is back on the road after a two-game sweep at home over Merrimack. The Catamounts defeated the Warriors, 5-1, in their first meeting, before coming up with a 4-3 overtime victory in game two. - Sophomore Max Kaufman (Rochester, N.Y.) had his hand in each game-winning tally over the weekend, dishing out an assist on Friday's game winner, before finding the back of the net in the extra frame on Saturday to send the Catamounts past the Warriors. 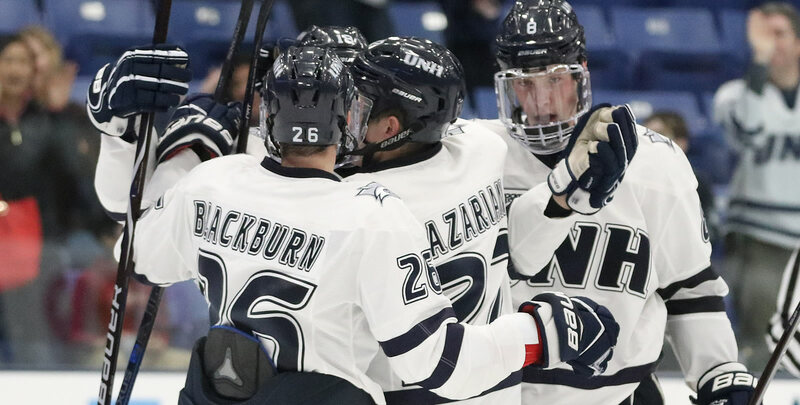 - New Hampshire and Maine will close out their three-game regular season series this weekend when the Wildcats host the Black Bears for two. The programs played to a 4-4 overtime draw in their first meeting of the year in a rare Monday matinee on Jan. 21. - The Wildcats enter the weekend after pushing their unbeaten streak to five games with a tie and win over UConn. They played the Huskies to a 2-2 stalemate before returning to home ice and shutting the Huskies out, 6-0. - Ara Nazarian (Boxford, Mass.) helped to generate the offense for the Wildcats, dishing out three assists through the two games. - Maine hits the road after hosting then-#2 UMass for two Hockey East match ups over the weekend. The Black Bears fell to the Minutemen, 4-2, on Friday, but bounced back to take a 4-3 victory in their second meeting. - Sophomore Jeremy Swayman (Anchorage, Alaska) was tabbed Hockey East Defensive Player of the Week honors after kicking out 113 shots last week. The netminder posted a season-high 53 stops, including 17 in the final frame, to help seal the victory on Saturday evening. - Boston University will take on #2 UMass on Friday, before meeting Northeastern in the opening round of the Beanpot Tournament on Monday night. Friday will be the first meeting between the Terriers and Minutemen this season, while Monday marks the third with the Huskies. This year's opening round Beanpot game will be a rematch from last year's championship game that saw Northeastern skate away with a 5-2 victory and their first Beanpot title in 30 years. - The Terriers are coming off of a weekend that saw them split a series with non-conference opponent Arizona State. They defeated the then-#15 Sun Devils, 4-2, in game one, but were shut out, 3-0, in game two. - Joel Farabee (Cicero, N.Y.) was named Pro Ambitions Rookie of the Week after posting two goals in the Terriers victory over the weekend, and two assists in the Terriers' 7-2 win over Merrimack on Monday. - The Minutemen look to bounce back after a weekend split on the road at Maine that saw them suffer just their third loss in Hockey East play on the season. UMass defeated Maine in their first meeting, 4-2, but dropped a 4-3 decision their second night on the road. - Rookie Marc Del Gaizo (Basking Ridge, N.J.) recorded three points in the split with the Black Bears, netting a goal and dishing out two assists. The defenseman recorded four blocked shots and a plus-two rating. He now has a plus-21 rating on the season, good for the lead among all NCAA skaters. - Boston College travels to UConn for their third and final regular season meeting of the year, before taking on Harvard in the opening round of the Beanpot Tournament. The Eagles hold the advantage over the Huskies after taking the first two games of their three game Hockey East series. Their meeting with the Crimson will be the first time the two teams have hit the ice together since the third place game of last year's Beanpot, which saw the Eagles drop a 5-4 overtime decision. - The Huskies will look to right the ship after going 0-2-1 in their last three games. They took a point in league play after playing New Hampshire to a 2-2 overtime draw on Friday, but were then shutout, 6-0, on Saturday. On Tuesday, their comeback efforts came up short in a 2-1 loss to non-conference opponent Sacred Heart. - The Eagles head into the first weekend of February after taking one point from UMass Lowell in a home and home series. They fell to the River Hawks 3-1 on home ice, before playing them to a 4-4 overtime draw. Boston College currently sits second in the Army ROTC Hockey East Standings with 19 points. - Oliver Wahlstrom (Quincy, Mass.) recorded his second career multi-point game in Saturday's tie, finding the back of the net once and adding an assist.